Last month marked the 50th anniversary of Dr. Martin Luther King’s “I Have a Dream” speech and across the U.S., many Americans proclaimed that Dr. King’s dream had indeed come true. Perhaps many people believe this because overt acts of racism aren’t as common and are typically frowned upon. However, covert forms of racism are all too common . These more subtle forms of racism are called “microaggressions” and communicate hostile and racial insults. Microaggressions are things said or done – many times unconsciously – that reflect a person’s inner thinking, stereotypes and prejudices. They are difficult to recognize because they are brief, innocuous, and often difficult to see. Why are they important to talk about? Because microaggressions are pervasive and have a detrimental impact on people’s psychological and physiological well-being. If you are Latina or Latino, you may have heard comments such as, “Wow, youspeak so well… You are not like them… You are really smart… OR You are different and they will really like you.” You might even be asked repeatedly where you are from if your first answer is a city or state in the U.S.
You might even be asked repeatedly where you are from if your first answer is a city or state in the U.S.
My colleague, Dr. Kevin Nadal, and I recently presented a paper at the 2013 APA Convention on Latinas/os’ experiences with microaggressions1. Our findings prove microaggressions are very real experiences for many Latinos/as living in the United States. Almost all of our participants, 98%, had experienced some type of microaggression within the last six months!We also found that when people experience microaggressions, they tend to experience mental health issues like depression and a more negative outlook of the world. 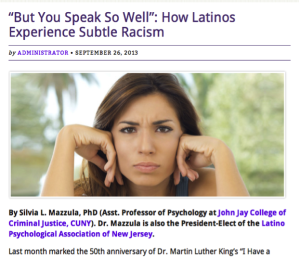 Latino, microaggressions, Race, Racism. Bookmark.